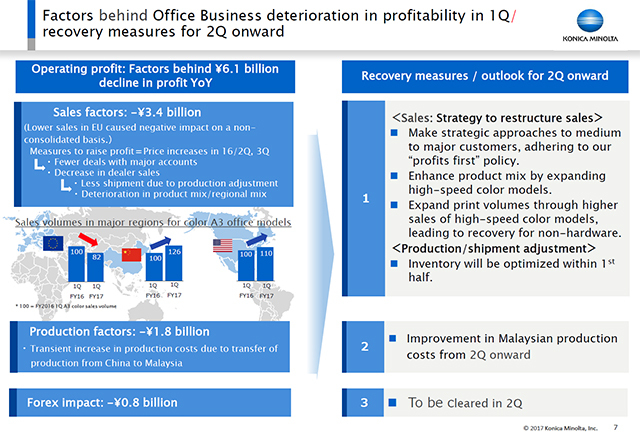 The chart on the left shows the main factors in the ¥6.1 billion decrease in operating profit. I consider this to be the key point of the period under review. We have broken out the year-on-year deterioration in profit in the Office Business into the three factors of "sales," "production," and " FOREX impact." The first factor, sales, was negative ¥3.4 billion. We have for some time been pursuing our ”profits first” policy. For that reason, we have increased prices since the second half of the previous year, but price competition from competitors has intensified and, as a result, this was reflected in the form of lower sales for major customers and indirect sales in this first quarter. In response to this fall in sales in the Company's largest market of Europe, we have implemented corrections to production and shipments, and it was the resulting decline in non-consolidated gross profit that caused the deterioration in operating profit. As the second factor of production, there was a ¥1.8 billion increase in costs. As part of the Company's revamp of manufacturing, some MFP production is being transferred from China to the new Malaysian factory, with the first quarter being the transition period for that process, as a result of which we saw costs rise. Finally we have FOREX impact. In the performance overview on the first page, we showed that the euro has been almost flat year on year, but while at the consolidated level we used the average rate for April to June, at the non-consolidated level we took the average for March to May, so in year-on-year terms the effect was that of a slightly stronger yen. The result was a negative factor of ¥0.8 billion. I will now explain the recovery measures we are taking with regard to these three factors in 2Q onward, and the outlook. First, with regard to the third factor of FOREX impact, if the euro/yen rate continues at the current level then the negative year-on-year impact is expected to disappear in 2Q. In addition, on the second factor of manufacturing costs, the prospects for cost improvement measures taking effect in Malaysia are good, so we anticipate getting back up to cruising speed and expect the situation to normalize. Finally, with regard to sales in Europe, we have restructured our sales strategy. Basically, there has been no change in the Company's “profits first” policy, but we have adjusted it so that we carefully screen projects and aggressively pursue those projects that we decide we should win. In this way we intend to bring about a recovery in sales volume, primarily of high-speed color models. By expanding sales of the strategic high-speed color models we will seek to increase print volumes, and to get the non-hardware side back into positive territory. In the second half we will launch new high-speed color models, and accelerate the shift in hardware sales towards the high-end segment. As mentioned earlier, sales of MFPs in the US and China were solid in the first quarter. In Europe in the second quarter we will strive to roll back the competition all at once, and restore the "earnings power" of the Office Business.